RAMALLAH (Ma’an) — Minister of detainee affairs Issa Qaraqe on Friday announced the dates for the release of veteran Palestinian prisoners from Israeli jails. Israel has agreed to release 104 prisoners, most of who were jailed before the 1993 Oslo peace accords, in four stages. The first batch of 26 prisoners was released on Aug. 14, hours before peace negotiations resumed in Jerusalem. The remaining prisoners will be released on Oct. 29, Dec. 29 and March 28, Qaraqe said at a meeting with prisoners’ families. Qaraqe said the release of the prisoners was not related to progress in negotiations, and that no prisoners would be exiled. The minister met with PLO negotiator Saeb Erekat and Palestinian Prisoners Society director Qadura Fares in Ramallah to discuss a strategy to improve prisoners’ lives after their release, Qaraqe said. The plan includes demanding that Israel stops arresting Palestinians during negotiations, improves the daily lives of prisoners and allows the return of Palestinian fighters deported in 2002 after Israeli forces laid siege to the Nativity Church in Bethlehem. After 40 days, the negotiations involving international organizations ended the siege with the deportation of 13 fighters to European countries and 26 others to the Gaza Strip. Israel agreed to let the fighters return to their homes after two years, but 11 years on the deportees remain in exile. Palestinian Minister of Interior and National Security of the Hamas-led government in Gaza, Fathi Hammad, stated that his ministry is ready for any possible Israeli war against the Gaza Strip, amidst threats of a US-led war on Syria. His statements came during a seminar with the Nurses Union in Gaza city. He said that Israel might use the situation to wage a war on the resistance in the coastal region. Hammad stated that his ministry is ready, and is acting on maintaining a strong interior front that is always ready to counter any Israeli aggression. He called on the Palestinian people, and the Palestinian factions, to be actively involved in supporting the resistance so that it can counter any aggression against the Palestinian people. “National unity is achieved under the umbrella of steadfastness, resistance, and the liberation of Palestine”. Hammad said, “God willing, we are, and will always be a united nation against the occupation”. Commenting on the closure of the Rafah Border Terminal, between Gaza and Egypt, Hammad said that this closure is causing a serious crisis that impacts the Palestinian people in Gaza, suffering from ongoing siege and aggression”. WEST BANK, (PIC)– Palestinian Authority security apparatuses arrested six citizens from the West Bank, and summoned three others for interrogation, on charges of their affiliation with the Hamas Movement. Meanwhile, the Authority courts postponed the release of four political detainees from Ramallah who have been held for 7 months despite the fact that the prosecution did not provide to the court any justification for their detention. In al-Khalil, the Preventive Security Service (PSS) arrested Polytechnic University student Suleiman Eid from the town of Bani Naim after summoning him. Elements of the PSS had previously tried to arrest him after a raid on his home. The General Intelligence Service arrested in Bethlehem two liberated captives and another from Qalqilya. The Authority apparatuses also arrested in Tulkarem two students at the University of Khadouri. The General Intelligence summoned in Salfit a former political prisoner and liberated captive from Israeli jails and in Ramallah a journalist and a young man for questioning. JERUSALEM (Ma’an) — Bedouin in East Jerusalem’s Zayem village say the Palestinian Authority is neglecting their struggle against eviction by Israel. Villager Mohamad Odeh Mousa Al-Saedi Jahalin said Israel had been trying to take control of Zayem since 1953. Fifteen families live in the village and they are continuously harassed by Israeli forces and issued demolition orders to force them from their land, he said. In 2011, Israeli forces demolished the tent-homes in the village but residents rebuilt them. Jahalin said Israeli authorities had offered him money to leave the area several times but he refused. Meanwhile, the PA announced that it would provide financial aid to the village but the money never arrived, he added. Speaking on behalf of families in Zayem, Jahalin appealed to President Mahmoud Abbas to instruct PA officials to support the village. “Expel Muhammad Dahlan From the Emirates!” is a campaign slogan launched by Emirates which has been widely spread across social networks such as Twitter, to express the rejection by a wide range of people of the presence of Mohammad Dahlan in Abu Dhabi, and his work as an adviser to the Emir Sheikh Mohammed bin Rashid. Dahlan is a traitor and dismissed leader from Fatah, founder of a death squad in the Gaza Strip which operated until 2006, and a spy for Israel. The Emiratis say: “Dahlan betrayed the Palestinian cause and nation in favor of Israel, so how do the UAE authorities accept this Israel-first agent to stay on its territory?”. The Emiratis accuse Dahlan of financing terrorism in the Sinai within the framework of a plan which distorts Islam and helps create ill will and conflict between Egypt and the Gaza Strip, which is under Hamas rule, the enemies of Dahlan. An earlier reports was released which states that Dahlan, the traitor, stands behind a number of terrorist and sabotage operations which have targeted the Egyptian army in the Sinai near the Gaza Strip, in coordination with the Egyptian police and in favour of Israel. Dahlan and his partners in the Egyptian police are planning to strike Gaza and crush Hamas so that ultimately Dahlan, Abbas, PA will be able to take control over the strip. Egyptian forces have tightened the control of Rafah, a town that straddles the Egypt-Gaza border, as well as the waters at the border to prevent any transport of merchandise into Gaza by sea. They expelled dozens of families from their houses on the Egyptian side near the Rafah border in the context of the implementation of an empty zone along the border with Gaza. Egyptian official said that they had destroyed over 350 smuggling tunnels since the army had deposed Islamist President Mohamed Morsi in early July of this year. On the eve of Brazilian Independence Day, a major Palestinian civil society coalition has called on Brazil to abandon a $35m development collaboration project with Israel during a meeting with Paulo França, the Brazilian consul in Ramallah. The delegation form the Palestinian Boycott, Divestment and Sanctions National Committee (BNC), the largest coalition of Palestinian political parties, trade unions, civil society networks and campaigns, urged Brazil to at least ensure that money from the project will not be diverted to Israeli companies that are implicated in human rights abuses and violations of international law. Brazil is currently deciding over public funding for research and development projects presented by Brazilian and Israeli companies for the amount of 35 million dollars. A study by BNC member Stop the Wall and the Palestinian Federation of Brazil (FEPAL) has shown that some 40% of the Israeli companies should pose doubts about their eligibility due to their participation in human rights abuses. 30% appear to either benefit from or aid the Israeli settlement project or are located in the settlements. 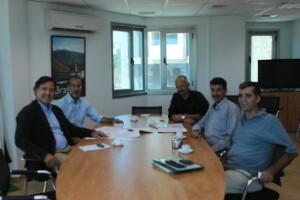 The delegation – comprised of of Zakaria Odeh (coordinator of the Civic Coalition for the Defense of Palestinian Rights in Jerusalem), Jamal Juma’ (coordinator of the Stop the Wall Campaign) and Salah Khawajah (spokesperson of the National and Islamic Forces, the coordination body of Palestinian political parties) – expressed congratulations to H.E. Luiz Alberto Figueiredo Machado for his appointment as minister of foreign affairs and handed over a joint letter. The BNC expresses hope that during his mandate Brazil will “continue on the side of justice and human rights until as well the Palestinian people have gained freedom from colonialism and occupation” and, in this spirit, urges the foreign ministry to stop the Brazil-Israel Research and Development cooperation project. “It is important to bear in mind that criteria for research funding should not only take into consideration the location of the actual research and the headquarters of the involved company but as well the fact that the research outcomes will inevitably be used by any company with relations to the illegal settlement project to the benefit of these operations. Once research is produced Brazil will not have any instruments to stop it from being used to the benefit of Israeli occupation, apartheid and colonialism. GAZA, (PIC)– Ministry of Interior and National Security in Gaza said that it discovered a plot against the Strip that targets political figures and aims to stir up unrest, and confirmed arresting some elements involved in the plot. “As they were put under surveillance and then held by the security services, they turned out to have collaborated with Israel’s Mossad,” he confirmed. He said that those elements were interrogated and they made serious confessions about the plot that aims to create chaos is Gaza, and added that the confessions revealed that the parties involved in the plot include Israeli intelligence services, and Intelligence Service and Preventive Security Service of the Palestinian Authority in Ramallah, along with other Arab Intelligence Services. Shahwan said that one of the suspects – who turned out to be a collaborator- has been caught on his way to Gaza after meeting with Fatah-affiliated leaders of Security Services in an Arab country. He stressed that targeting the Gaza Strip and the resistance factions represent desperate attempts that will not succeed in breaking the will and steadfastness of our people. The spokesman held Israel and its Palestinian and Arab tools, attempting to plot against Gaza, its people and resistance, fully responsible for all the consequences of their plotting. In a twist of irony that has escaped mainstream commentators, one week away from 9/11, the US is considering a course of action that will empower al-Qaeda; i.e., bombing Syria. As terror expert Evan Kohlmannput it, “two of the most powerful insurgent factions in Syria are al-Qaeda factions.” (Kohlmann is an authority on the topic, having worked as a consultant in terrorism matters for the DoD, DOJ, FBI, and other law enforcement agencies.) These rebel factions will be the immediate beneficiaries of a strike against the Assad regime. This wouldn’t be the first time that the intelligence community expected a US military operation to increase the likelihood of terror attacks against the US. As a letter from CIA Director George Tenet to the Senate Intelligence Committee chair revealed, it was anticipated that Bush’s invasion of Iraq would lead Saddam Hussein to be “much less constrained in adopting terrorist actions”; moreover, the invasion of Iraq was expected to raise the threat of attack by WMD from “low” to “pretty high”. And the intelligent experts were correct. Earlier this year, Dzhokhar Tsarnaev told the FBI that he and his brother carried out the Boston Marathon bombing because they “were angry about the U.S. wars in Afghanistan and Iraq”. We can only hope the intelligence experts like Evan Kohlmann won’t be correct this time around. If we had an authentic democracy—rule by the people—an attack wouldn’t happen, because strong majorities oppose intervening in Syria. Polls conducted by Reuters almost daily between May 31st and September 3rd indicate without exception that a strong majority of Americans are opposed to intervening in Syria—even if Syria used chemical weapons. Similarly, a poll conducted by the BBC shows that, in the UK, “71% of people thought Parliament made the right decision” to reject military action against Syria. Two thirds of respondents said they wouldn’t care if Parliament’s decision harmed UK-US relations. Another poll shows that a stunning 80% of Americans believe that Obama should seek congressional approval for a strike on Syria. The Obama administration has interpreted this rather narrowly, having scheduled a congressional vote, but still insisting that Obama “has the right to [attack Syria] no matter what Congress does”, as Secretary of State John Kerry remarked. Obama said the same thing, albeit somewhat more tactfully: “I believe I have the authority to carry out this military action without specific congressional authorization”. The polls pertaining to the prospective strike on Syria differ significantly from those regarding the US and UK support for the Iraq War. Back in 2003, a series of polls found that a majority of Britons supported the invasion of Iraq; Americans at the time supported the invasions by evenlarger majorities. Simply put, there’s less support for a strike on Syria than there was for the invasion of Iraq—and we know how well the Iraq War turned out. Yet public opinion and the threat of provoking terror attacks are not persuasive to the unfathomable wisdom of the Obama administration. As John Kerry said, a strike on Syria “is of great consequence to…all of us who care about enforcing the international norm with respect to chemical weapons.” Apparently Kerry is more concerned with international norms than international law, since attacking Syria without a U.N. Security Council resolution would violate the latter. In Obama’s words, the Security Council is “paralyzed”—which, by definition, means it won’t do what he tells it to do. To be fair to the Obama administration, we should listen to what US leaders have to say about chemical weapons; they’re experts on the matter. In Iraq alone, they used white phosphorous and depleted uranium munitions, which coincided with an explosion of birth defectsthroughout Iraq that “surpassed those of Hiroshima and Nagasaki after the nuclear attacks at the end of WWII”. Despite difficulties, Gaza’s Ark is moving ahead! An important phase of rebuilding Gaza’s Ark is now completed: custom steel reinforcements of the hull have been installed (see http://www.gazaark.org/2013/06/05/gazas-ark-photo-album/), in spite of difficulties facing work in Gaza (see http://www.gazaark.org/2013/08/21/changing-circumstances/). Since this spring, with help of supporters like you, our campaign has managed to inspect, test and purchase the boat that we are transforming into the cargo vessel, Gaza’s Ark. The former fishing boat was then cleaned and unneeded fishing tackle removed, so that above-water wooden portions could be sanded and waterproofed with fiberglass. We are currently close to also finishing the installation of the fuel, water and waste tanks. We are also pleased to announce that we have now raised over $150,000, passing the mid-point towards our fund-raising target for the whole project. We have got this far with your help, and we still have much to do together. Our Consulting Marine Engineer (a volunteer member of our Steering Committee) and Project Manager have finished design plans (see http://www.gazaark.org/2013/09/04/gazas-ark-being-built-to-specs/), and next we will embark on a major phase of the project: building the cabins and accommodations. This work is scheduled to commence this week. Building the cabin should take a few weeks and will cost $6,500 in materials and at least $3,000 in labor costs. In addition to building the cabin and finishing the interior, we will need to waterproof the submerged parts with fiberglass after getting the boat out of the water. There will be communication and safety equipment to purchase and install (see http://www.gazaark.org/2013/06/19/help-refurbish-gazas-ark for specific items for which you or your organization can help pay), as well as costs for inspection and certification before we can outfit the boat for an ocean voyage. We hope that you will continue your generous contributions so the work does not slow down and we don’t face any delays in making the remaining monthly installments of the purchase price. You can buy shares in hope (http://www.gazaark.org/2013/01/15/buy-a-symbolic-share-of-gazas-ark-a-share-in-hope/) to contribute towards payments and other costs of preparing Gaza’s Ark to sail. You can also donate http://www.gazaark.org/donate by cheque or other means of payment. By supporting Gaza’s Ark you are helping to challenge the blockade, creating work in Gaza and empowering the Palestinian population in Gaza in these very difficult times when they are facing increasing difficulties. The presence and continued expansion of Israeli settlements in occupied Palestine has created a major obstacle for the efforts to establish peace in the Middle East. Israeli bulldozers have started to level the Palestinian land for the construction of 620 more illegal housing units in the settlement of Pisgat Ze’ev in East al-Quds (Jerusalem),Press TV reports. Pisgat Ze’ev, where more than 50,000 Israelis live, is one of the five major Israeli colonies, which were established in East al-Quds annexed by Israel after the Six-Day War of 1967, a Press TV correspondent reported on Wednesday. Israel also occupied the Gaza Strip and the West Bank during the 1967 war. Every single unit that has been built or being built on the occupied Palestinian land is at the expense of Palestinian lives and their existence, Jamal Juma, the coordinator for the Stop the Wall Campaign, told Press TV. Israel has announced plans to construct more than 3,000 housing units in al-Quds and the occupied West Bank since the resumption of so-called peace talks in July. In August, Israel announced tenders for about 3,100 housing units in the West Bank and East al-Quds. The Israelis have intensified their settlement building activities since the start of the negotiations which means they are not serious about the peace talks, Juma told Press TV. On Tuesday, Israeli and Palestinian negotiators met in the latest round of talks. According to reports, chief Palestinian negotiator Saeb Erekat and Israeli Justice Minister Tzipi Livni attended the meeting. The officials presented their views on different issues, but no agreement was reached. More than half a million Israelis live in over 120 illegal settlements built since Israel’s occupation of the Palestinian territories of the West Bank and East al-Quds. The United Nations and most countries regard the Israeli settlements as illegal because the territories were captured by Israel in the 1967 war and are hence subject to the Geneva Conventions, which forbids construction on occupied lands. On August 13, US Secretary of State John Kerry said that all Israeli settlements on the Palestinian territories are illegal. “Let me make it clear. The policy of the United States with respect to all settlements is that they are illegitimate,” he said.